Modern Suspension Casters are designed for use in challenging environments, like the ones encountered by the military. Whether its an army base, air force runway, a navy ship or a coast guard station, Modern Casters are built to perform. With unique benefits like heavy duty springs, high weight capacities, independent suspension and ease of roll, Modern Suspension Casters are the right choice for the job. Our aluminum corrosion resistant casters, are light weight but not light on strength. These casters can handle a max load of 6,500lbs per caster and with stand the elements. Making them a perfect choice for Navy and Coast Guard applications where corrosion is a problem for steel and iron. When loading a cargo plane, every pound maters, and aluminum will shave some pounds off of the total weight. Aluminum casters weigh as much as 50% less than iron or steel; On heavy duty casters, that can be a reduction of as much as 200lbs a caster when using aluminum. 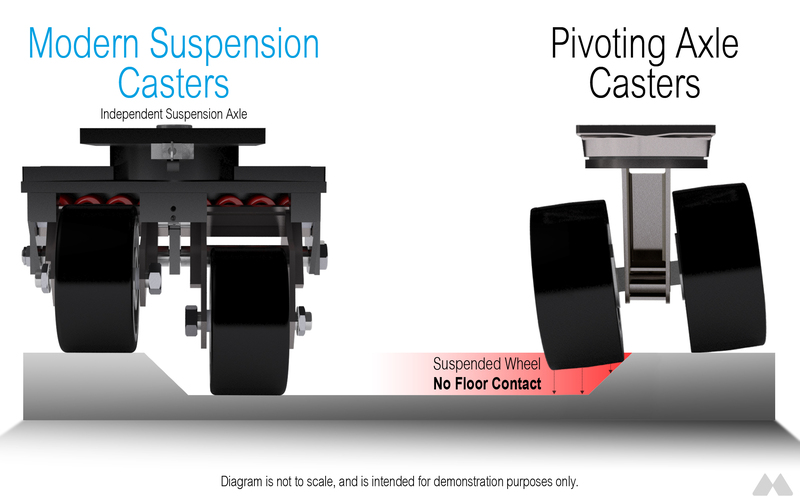 Our COMPLETELY INDEPENDENT SUSPENSION on the dual-wheel series (see diagram below). Each wheel is on its own separate axle with separate legs, its like having two separate casters on one top plate. This is extremely beneficial because it helps to keep both wheels on the ground and the cart or dolly level, even when the ground is not level, or an obstruction is encountered. It also helps avoid excessive stress on just one wheel, reducing the risk of failure and potential injuries. Modern Suspension Systems offers Military Spec Casters that usually meet or exceed requirements when Aerol is specified, making them a good alternative to consider. Modern Suspension Systems is the only other manufacturer of heavy duty, shock absorbing aluminum casters in the U.S.